2015 was something of a bumper year for viola da gamba players, as Telemann's Fantasias for Viola da Gamba were re-discovered. 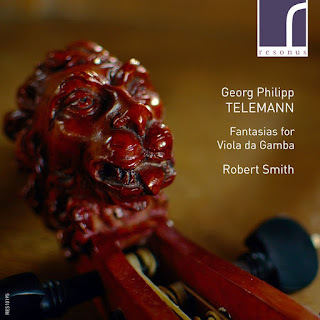 On this disc from Resonus Classics, viola da gamba player Robert Smith performs all 12 fantasias. Musicologists have long known that Telemann wrote sets of fantasias for harpsichord, flute, violin and viola da gamba. But whereas the music for the harpsichord, flute and violin sets survives, all that we had for the viola da gamba sonatas was the press announcement. Then in 2015, a complete manuscript was found in the Lower Saxony State archive. Each of the twelve pieces has two or three short movements (there are 34 tracks on this 79 minute disc). The last movement of each sonata tends to be light-hearted and dance-like, and throughout there is great fluidity and fertility to Telemann's imagination. By the time he came to write the fantasias (published in 1735) the viola da gamba was rather an old-fashioned instrument. Telemann self-published the music and it was clearly intended for good amateurs (the biggest market for published music). In his article in the CD booklet, Robert Smith argues that though the music is intended for amateurs, there is nothing easy about it for professionals. And perhaps because he was writing for a rather out of date instrument, Telemann's writing is highly imaginative with plenty of lively and striking touches. This is certainly not music which just noodles along. The music is not as profound as, say, Bach's solo cello suites, but it is imaginative and engaging. The short movements are each strong in character, and the charm of this disc is the way Robert Smith weaves from one to another, creating a rather striking whole. His playing is thoroughly engaging, and clearly happily engaged with this music, you can sense his delight in some of the little turns of phrase. His tone is beautifully elegant, you might even say silvery, and matches the fluidity of Telemann's writing. The sound quality is clear, close enough to hear the detail but without the sense of being at the soloists elbow. This is not the first recording of these works, and it certainly will not be the last; expect a rash of distinguished viola da gamba players going into the studio but I can certainly recommend this version wholeheartedly.